Pianist William Cuthbertson, who was born in Sevenoaks, England, has lived in Waldkirch in the German Black Forest for many years. He plays an active part in local cultural activities, both as performer and organiser. As a child, Cuthbertson won many musical prizes in his home county of Kent as a pupil of Bernard King at Sevenoaks School. During this time he had additional lessons with Vivian Langrish. 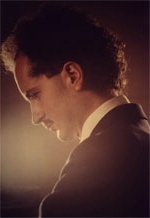 He studied piano performance and composition at the Royal Academy of Music in London with Ruth Harte and Gordon Green. He then continued his studies at the Akadamia Muzyczna, Krakow, Poland on a Polish Government scholarship, studying with Ludwik Stefanski, and has continued to specialise in playing the works of Chopin. A very significant person in William Cuthbertson’s life was the renowned London-based German pianist, composer and pedagogue, Peter Feuchtwanger. From 1999 William Cuthbertson organised an annual International Master Class with Peter Feuchtwanger in Waldkirch. Since Feuchtwanger´s death in 2016 the Master Class continues to take place with Cuthbertson - click here for details. Cuthbertson is considered a master of improvisation, a skill he developed at Sevenoaks School under the guidance of Brian Townend and from time to time he accompanies silent films with free improvisation at the local community cinema, Klappe 11. His teaching is eclectic, using what approach is most applicable, complimantary and at the same time in harmony with Peter Feuchtwanger‚s brilliant insights. William Cuthbertson has given concerts in Germany, Holland, Poland, Denmark, Norway, England, Russia, Austria, Sweden, Switzerland and the United States. In 2010, Chopin’s 200th anniversary, he gave a series of six recitals in Waldkirch and in 2011, three Liszt recitals for Liszt's 200th anniversary. In November 2017 he served on the jury and performed at the 4th Thailand International Chopin Competition in Bangkok. Click here for press reviews.